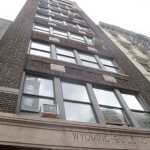 Gallery Installation Opens Feb. 2 at the Wyoming Building, #5 E. 3rd Street from 6-8pm. We are in New York City for the final installation of Synchronous Objects: Degrees of Unison, a multi-part video and sound installation that we created using elements of our original online work and re-imagining them in space and time. 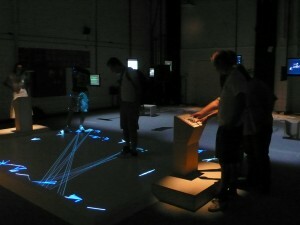 Unlike the web-based work, this installation gives an immersive and simultaneous experience of several objects. The sounds of the dancers and Bill Forsythe’s voice move through the space around you as you view 7 different visualizations playing out in sync in the 15 min time frame of the dance. For this installation we arranged the screens in a ring shape that is viewed from within. We’ve also done it as a forest of smalls screens at PACT in Germany and as large abstractions in a giant warehouse at the Taipei Arts Festival in Taiwan. Andre Lepecki has also worked with the Goethe Institute NYC to organize an interesting symposium on the nature of the object in relation to performance in which Norah Zuniga Shaw will present Synchronous Objects and Forsythe’s concept of Choreographic Objects. We’re very interested in the perspectives of so many artists and scholars coming together and it is open to the public to listen in. We had a great experience exhibiting Synchronous Objects at the Taipei Arts Festival alongside several of Forsythe’s choreographic objects. Also taught workshops for artists and engineers and enjoyed sharing these ideas with a broad range of intelligent, curious, and engaged arts audiences in Taipei. Next on the list are Bangalore, Tokyo, and New York. Synchronous Objects is still on the road showing up in cities far and wide from Beijing to Chicago and Zagreb to Bangalore. 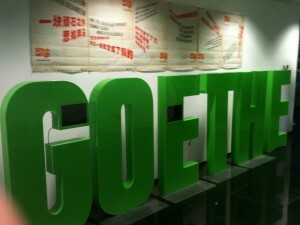 Of course you can always see it any time, any where online but The Goethe Institute has also made Synchronous Objects the subject of their Forsythe Module. Curated by Petra Roggel, the Forsythe Module helps to share the work of Forsythe in locations not typically visited by the Company. We are doing this by exhibiting Synchronous Objects in a variety of installation formats: everything from working kiosks and interactive reading rooms like we did at the Wexner Center, Columbia College, SIGGRAPH etc. to immersive video installations that re-imagine the screen-based work in space and time as we did at ISEA-Rhur 2010 and will do next week at BADCo’s Symposium on choreography and software in Zagreb, Croatia and this summer at the Taipei Dance Festival alongside a large selection of Forsythe’s installation works. Norah Zuniga Shaw (project co-creative director with Forsythe and Maria Palazzi) travels with the exhibitions to give public lectures and conduct interdisciplinary workshops. 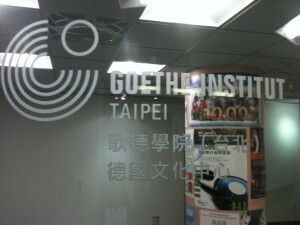 In 2010 the Goethe Institute sent Shaw and Synchronous Objects to the Tanzplatform and ISEA-Rhur 2010 in Germany and to Beijing, Taipei, and Tokyo. 2011 finds us in Croatia, Hungary, Turkey, Romania, India, Taiwan, Japan, New York City, Brazil, and beyond. Hope to see you around. 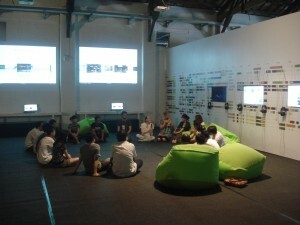 Chris Roman and Norah Zuniga Shaw demonstrating alignments in a panel discussion with architects and musicians in Beijing China this autumn 2010. In the year since our launch Synchronous Objects continues to travel the world through workshops, lectures and exhibitions. Most recently students in Beijing participated in a workshop with Forsythe Company dancer Chris Roman and Sync/o creator Norah Zuniga Shaw. The next workshop is at ICK-Amsterdam in December 2010. 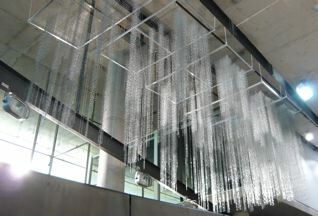 And in August of 2010 Synchronous Objects was shown in a new form as a commission of the ISEA Ruhr 2010 exhibitions in Essen Germany at PACT Zollverein. This exhibition, created by Norah Zuniga Shaw and titled “Synchronous Objects: Reproduced” was a multipart installation is a spatial and temporal re-imagining of its web-based antecedent. For this new work, Zuniga Shaw stayed close to the conceptual foundations of the original while extending them into the architectural and experiential possibilities of an installation. 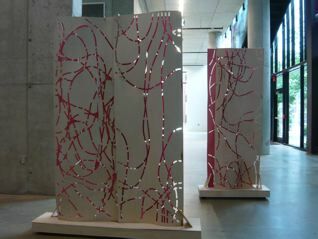 Moving through three rooms, visitors encounter the deep structures of a dance and the generative ideas contained within. In the first room, large-scale video projections of the dance are presented in proscenium space. Quickly this shifts to the analytical perspective in the second room where a table from the live performance of the dance is the foreground for the animated traces of choreographic structure that reveal patterns of relationship and intention. And in the final room visitors enter the multidirectional space of counterpoint, the visitors’ combined choices, attention, and actions become the structural core of the work as they engage with an array of synchronous objects: visualizations synced in the 15 minute time span of the dance; responsive graphics with which they can construct their own choreographies; a 7-channel audio composition shifting the sound of the dancers’ motions and Forsythe’s voice around the room; and a paper proliferation of creative processes falling into the space to be read, left behind, or carried home. Last spring interior design students in the Industrial, Interior, and Visual Communications Department at The Ohio State University, were asked by Professor Susan Melsop to study One Flat Thing, reproduced through the Synchronous Objects website as a creative resource for their work. And this year she has decided to use the project again with her students so we thought it was a good time to share what they are doing. “We use Synchronous Objects to explore space making, movement, and spatial composition. Students report (this year and last) that the dance challenges them and can be difficult to comprehend at first. For them, the Sync/O site serves to unlock the legibility of the dance as subtleties are revealed and patterns made explicit. 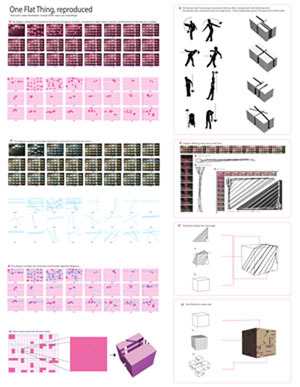 In my course, I ask students to analyze One Flat Thing, reproduced and Synchronous Objects with the suggestion that the disciplines of dance and interior design share many parallel characteristics. Both are based on spatio-temporal conditions. Both are situated in perceptions of experience. Both use systems of organization to construct logic and creative play. Interior space making is functional, creative choreography. And the structure of a body is architecture in itself. It is a salient architectonic form that interplays with dimensions of space and time. Space itself is pliable, active and alive (paraphrased from Merce Cunningham’s video Points in Space). Breath and air are essential to the body and to the space, rendering each kinesthetically dynamic. 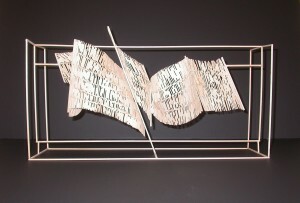 The body in motion designs the space and the space navigates the body’s movements. This object by student Jeremy Escalera brings the collective network of communication in the dance and the spatial distribution to the forefront. The sculptural columns constructed by Lisa Schmidt demonstrate the independent gestural alignment of dancers as they participate in the foreplay of cue. We understand through Synchronous Objects that alignments are essential to how visual relationships are constructed in the dance. In this project by Stephanie Payton alignments between the dancers become shifting landscapes of three dimensional surfaces. 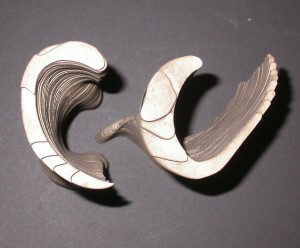 They create an independent architecture of form and flow. 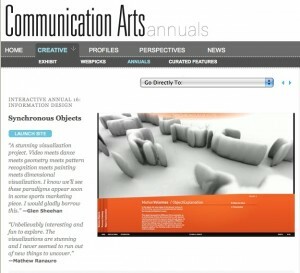 The new edition of Communication Arts Interactive features Synchronous Objects you can view a nice web summary here. We are thrilled to be one of 38 winners selected from 1000s of entries. One of the goals of our project is to place dance and choreographic knowledge at the center of other disciplinary discussions. This goal is an outgrowth of Forsythe’s experience with his earlier media object, the Improvisation Technologies CD-Rom which was taken up by architects as a creative and pedagogical tool when it was published in the 1990s. Architecture is once again showing an interest in the Sync/O project but we’ve also seen an expanded interest on the part of designers as evidenced by this Communication Arts feature but also by selection of our work for the SIGGRAPH 09 Information Aesthetics Showcase and features on the Information Aesthetics blog and on visualcomplexity.com. 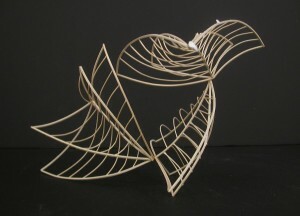 And in a nice bit of synergy, our guest contributor last week, Kristin McGuire suggests the connections between choreographic and design pedagogy. So then, if we consider choreographic thinking to be an important site of knowledge for many contemporary concerns in other fields how do we continue to broaden the dialog? What about choreography as form of geographic thinking, a source of knowledge for urban planning, or an important resource in gestural interface design for things like Microsoft’s project Natal or new games for the wii? For those of us in dance this may seem clear. But how do we continue to communicate and to bridge the gaps? Thoughts? “Synchronous Objects was the subject of the second lecture within a trilogy, which developed ideas from the “choreographic algorithm” to the “choreographic object” to the “choreographic construction”. 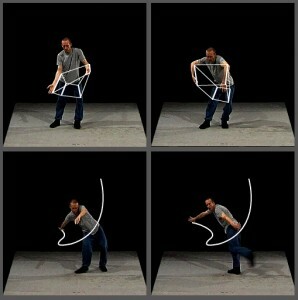 All 3 lectures revolved around the work of William Forsythe. The lecture series started with the analysis of Improvisation Technologies, which provided a rich database of dance operations and instructions. I found that they could be used in order to define a choreographic algorithm and as such create a dance piece. An algorithm is defined as a precisely described set of instructions. During this lecture the students were asked to develop a choreographic construction using orthographic drawings of a building (see image below). As they were keen to “manifest” those constructions in a dance piece they created work based on those constructions, which turned out to be very exciting material. 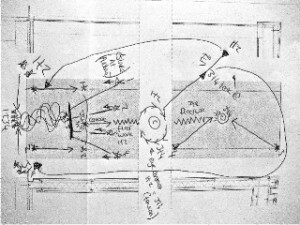 More of the drawings as well as the dance material can be viewed on http://advanceddancetheories.blogspot.com/. Synchronous Objects was the subject of the second lecture in between the two I have just described. The idea of the choreographic object as Forsythe describes it seemed to sit well in between a choreographic algorithm – a well-defined yet clear and simple mathematical structure – and a choreographic construction – a complex, multi-layered, 4-dimensional construction of kinetic events. Synchronous Objects was a real eye-opener to my students who said that they had never come across anything like that. Since knowing this tool they take their dance pieces apart and reassemble them on timelines; they develop cueing systems for their dancers; they look at the dance floor as a map etc. Since looking at the science inside One flat thing, reproduced they have become researchers of their own creative practical work. Apart from the impact that Synchronous Objects had on my students I can say for myself that it clarified and thus resolved a contradiction of concepts about dance in my own mind. It made me realise that dance has left the dramatic performing arts world, which is still based on narratives. Choreography in my eyes is DESIGN as opposed to performing arts and it would be worth piloting an academic project based on a design syllabus rather than on a performing arts/drama syllabus. Below we profile three final projects created in Professor Stephen Turk’s second year undergraduate installation class conducted during spring 2009 at the Knowlton School of Architecture at the Ohio State University. 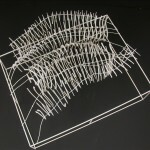 This studio deals with material fabrication, notation and fundamental representational skills. 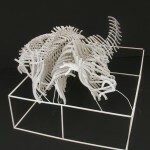 The images are from the students’ preliminary results from their research analysis and design investigations and the final installation in the Knowlton School of Architecture. Project team: Ross Hamilton, Heather Brandenburg, Sarah Simeon, Minyoung Kim. 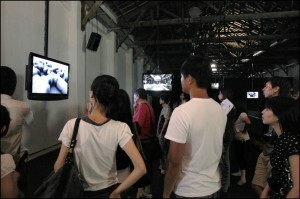 The Screen Machine is an installation that reveals and conceals the body. The Screens are made to reconfigure an open space, thereby inviting new pathways for people to move. Beyond reconfiguring the space, the screens perceptually reconfigure the body, as onlookers peering into the screens or gazing from a distance perceive a fragmented body as they catch sight of pieces and parts of the human form through open slits in the screens. 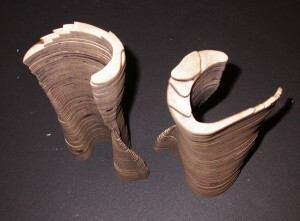 The placement, size and design of the slits were determined by examining the cues in One Flat Thing, reproduced. 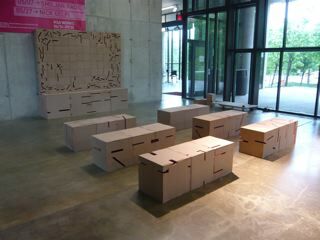 Cubes is an installation of performative objects, created for users to assemble and reassemble, discovering new alignments between slots cut into the sides of each module. As a system of combinatorial elements, Cubes also explores counterpuntal relationships in the space between the body of the user and the placement of a cube. 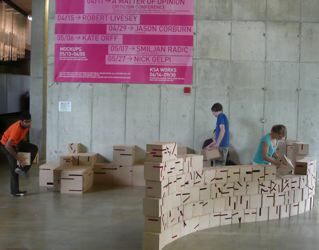 Cubes was inspired by Forsythe’s use of counterpoint in One Flat Thing, reproduced, as the project team looked for moments of counterpoint in the placement, spacing, and orientation of the cubes. 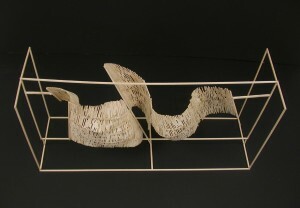 Papers Clips is an installation that examines the absence and presence of motion, measuring the density of an action inscribed in a space overtime. Examining the entrances and exists in a 5-second section of One Flat Thing, reproduced, Jeff Anderson and his team created a map that charted the absence of a movement as a dancer exited the performing area. 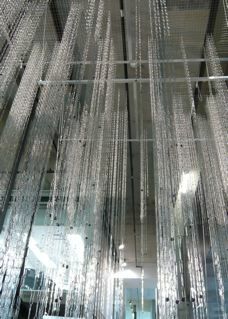 The strands of hanging paper clips hung above the visitors to the installation, vary in length depending on the density of movement at that particular second in the dance.